How we manage to be at all. Grace and Tippi don’t like being stared and steered at, but they’re used to it. They’re conjoined twins – united in blood and bone. What they want it to looked at in turn, like they truly are two people. They want real friends. And what about love? 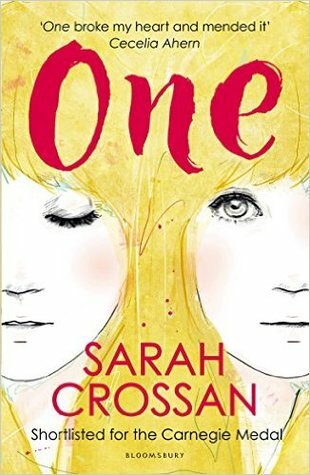 After reading the back of this book I wasn’t sure if it was something I would be interested in but Sarah Crossan managed to create the story as if she was just witness to these events unfolding rather than her imagination. This book flows so beautifully that it is such an easy read. You get attached to the characters without even realising it in the very start and it deals with such a different issue that most people could not possibly comprehend the difficulties involved. But what Sarah Crossan does is make you think. You see the human beings rather than the condition. The layout of the book was strange to begin with but for me it worked perfectly. It held my attention easier and to me it seemed more like thoughts from the character rather than storytelling. It was as if each sentence was seen exactly from the characters perspective (you will understand if you start reading it). I think this is why you get attached to the characters so quickly. This book deserves every award it gets, I have so much love for this book and the ending is just heartbreaking. You can feel the pain the characters feel. I am not going to go into it much more than that because I don’t want to spoil it but this book is one of my favourites and I recommend it to everyone no matter what your initial thoughts are about the blurb or the topic. It truly is a gorgeous piece of writing and I will be looking into reading more of Sarah Crossan’s books in future. 4.5/5 simply because I want to know more.